Ah! This world is such a cruel place to live. “If you have too much of play time, you become spoilt. But, if you study hard and work hard, you will become royalty!’’ This is something I heard in a movie, and I was shocked to see how parents poison their child’s brain. Why can’t we set them free? By setting them free, I do not mean to say that you should leave them alone, but there is a serious problem with controlling a child’s thought process. My question is – What makes you think that a sportsman/athlete does not work hard? If a child is excellent at swimming or soccer, we tell him to love it as a leisure or extra-curricular activity. What if the child has extraordinary skills as a soccer player? He can make a great career out of it and make the nation proud! As far as I can see, even the doctors, professors, and engineers enjoy watching the cricket match. These athletes/sportsmen are representing the nation, and they are working extremely hard to make the nation proud. Are you a Guiding or Controlling Parent? I want you to ask yourself this question. Are you a controlling parent or a guiding one? We all want to raise a child to be an engineer, doctor, or just a rich robot! Why can’t we raise a good human being? Once the child grows, we tell him to join the race and be competitive. 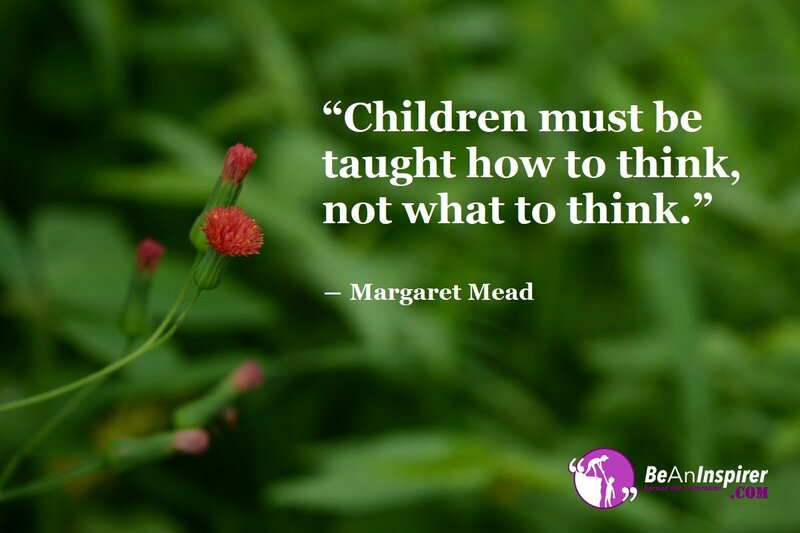 When Margaret Mead talks about teaching a child how to think and not what to think, she is trying to say that you must never poison a child’s mind. They should be taught to be independent and fearless. Once they grow old, they are wise enough to make their own decisions. What if their dream is to become an artist? Just because you want them to become a doctor or an engineer, it does not pass as being a good parent. Ask the child whether he/she has any dreams. Support it and give them good guidance. Do not control a child and tell them what to think! Set them free; they are children and not robots. Robots are designed in such a way that they accept your commands! A child’s mind is so beautiful! It is full of dreams, hopes, and wishes. We poison a child’s mind by filling it with doubt, mystery and fear. A good parent will guide the child, but will never tell the child to do as you please! Set them free and let them breathe peacefully! Do you know that a child will despise you for controlling his/her thought process? Give your child the much required space and let them choose a career, love, and path themselves. They will learn to walk! There will be hurdles, but they will respect you for giving them space.